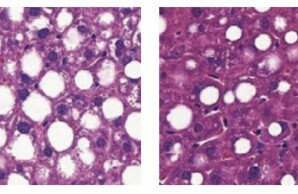 Mouse livers with AMPK activation (right) show less fat accumulation (white spots) than those without AMPK activation (left). AMPK, a protein that is a master regulator of metabolism, is thought to be important for treating various health issues, including obesity, type 2 diabetes, and certain liver diseases and cancers. It works as a biological spare fuel tank, called upon in cells when their energy supplies run low. A new study now offers a way forward for researchers to put this promising drug target through its paces. Researchers led by Reuben Shaw, the Director of the Salk Cancer Center at the Salk Institute for Biological Studies in California, developed a novel AMPK mouse model system that allows scientists to decide where and when to switch AMPK on, in any particular tissue and at any time in the mouse’s life. This setup presents key advantages over prior animal models in which AMPK was activated in utero and had to remain activated throughout the mouse’s whole life, complicating efforts to tease out mechanisms of action and possible therapeutic functions. In the first study using this new AMPK mouse model system, researchers genetically engineered mice with the AMPK “on” switch confined to their livers. They then fed these mice high-fat diets. The mice grew obese, with excess fats marbling their livers, mimicking a common human ailment known as nonalcoholic fatty liver disease. Called NAFLD for short, it is the leading cause of chronic liver disease in adults and often a precursor to serious conditions such as cirrhosis, liver cancer, and type 2 diabetes. When the researchers flipped on the AMPK gene, fat levels dropped in the obese mice’s livers, and inflammation and other signs of disease onset were reduced compared to mice that did not have the gene turned on. The healthful fat-shedding and metabolic-balancing from the AMPK-boosted livers extended to the rodents’ whole bodies, presumably because the livers released beneficial hormones into the bloodstream.